In October 2008 the Ontario government began broad public consultation for its 5-year review of the Waste Diversion Act by releasing the discussion paper Toward a Zero Waste Future and launching a 90-day consultation period that ends on January 15, 2009. CIELAP has produced some background papers and an online wiki to provide context for this review and to promote discussion. We are also preparing a report that will include recommendations for improving the Waste Diversion Act. Please contact us if you are interested in participating in this process. This paper was published by Water Resources Management, a peer reviewed journal, and was authored by CIELAP researchers Satya P. Mohapatra and Anne Mitchell. The research supports changes in policy to conserve and manage groundwater sources more effectively in the Great Lakes basin. Recommendations include working towards sustainable groundwater allocation, regulating water prices for water conservation, conservation education, pollution prevention, recycling and reuse of water as well as effective information management. Access the paper's abstract. Please donate to CIELAP. CIELAP is an independent, charitable environmental policy think-tank. Your donation will help us continue our policy analysis and bring our recommendations to policy makers. You will receive a tax receipt for your donation. Congratulations to Emond Montgomery Publications for publishing "An Introduction to Environmental Law and Policy", authored by Paul Muldoon, Alastair Lucas, Robert Gibson, and Peter Pickfield. 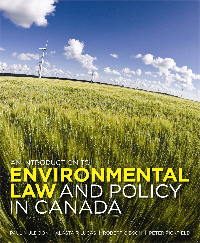 This 258-page resource offers a comprehensive look at current laws and policies governing Canada’s environment and natural resources. CIELAP is selling the book at our office for $60.00. To purchase the book from CIELAP, please contact Carolyn – (416) 923-3529 x26 – and arrange a time to pick it up. The authors have agreed that the royalties from the purchase of this publication go to CIELAP. The book can also be purchased directly from Emond Montgomery Publications. Great gift idea! Make a $200 donation to CIELAP and request a copy of the book - we'll send it to you with a tax receipt made out for $140. On June 26th, Parliament passed the Federal Sustainable Development Act , which aims to incorporate sustainability principles in the entire decision-making process in Canada. The Act, also known as Bill C-474 was sponsored into the House of Commons by Liberal MP John Godfrey and into the Senate by Alberta Liberal Grant Mitchell. The policy requires government to create and implement a national sustainable development strategy that is reviewed and evaluated every three years. It also mandates the formation of a new Cabinet Committee on Sustainable Development and a new Sustainable Development Office within the Department of the Environment. A Sustainable Development Advisory Council will also be introduced and will include members from businesses, Aboriginal, labour and environmental groups. The Act built on the work of a number of organizations, including the David Suzuki Foundation, the Natural Step, and CIELAP, who have been calling for stronger sustainable development policy and action at the federal level. Access CIELAP’s past sustainable development analysis to learn more about our work in this area. Environmental Commissioner of Ontario releases 2007/2008 Annual Report - Getting to K(NO)W.
This year’s report is entitled “Getting to K(NO)W”. The title refers to challenges involved in public participation in environmentally significant decisions – saying ‘NO’ to bad projects and being in the ‘KNOW’ in order to properly participate. Other issues addressed in the report include Ontario’s undervalued water, fostering a false sense of security regarding environmental and human health safety, and Ontario’s Biodiversity Strategy. On September 30, 2008, the Waste Reporting Act passed first reading in Ontario. Bill 105 proposes that carriers picking up or removing waste from industrial, commercial and institutional (IC&I) sites must keep an accurate record of the amounts of recyclable waste and non-recyclable waste they handle and submit this information quarterly to the Minister of the Environment. Similar requirements for operators of waste disposal sites have also been proposed. The Act’s intention is to help the province get a better understanding of how much IC&I waste is actually recycled and to move towards increasing this amount. For those that do not comply, fees between $10,000 and $50,000 will be enforced. On June 19, 2008, Ontario Regulation 215/08, amending the General Regulation (73/94) under the Environmental Bill of Rights, 1993, was filed. This amendment updates references to ministries and acts that have had name changes and prescribes certain provisions of the Environmental Bill of Rights, 1993, to specific ministries and acts. With regard to comments received by the public, the majority supported the government's proposal but felt the regulation was missing the inclusion of a number of ministries and acts. In August 2008 the Ontario government announced its proposal to create a toxics reduction strategy, which is a step in the right direction towards lessening the exposure of Ontario residents to toxic substances. CIELAP’s response on the Discussion Paper recommends additional measures to ensure that the public has minimal exposure to toxic substances. In August 2008 CIELAP provided comments on Ontario’s proposed Lake Simcoe Protection Act. CIELAP’s recommendations include placing a greater emphasis on the environmental impacts of pharmaceuticals, personal care products, and endocrine-disrupting substances in sewage sludge, as well as expanding the greenbelt to include more of the Lake Simcoe watershed. CIELAP also feels that the Act offers an opportunity for the government to move ahead on reducing the presence of polybrominated diphenyl ethers (PBDEs) in water by introducing tightened regulation of PBDEs. Guideline C4: The Management of Biomedical Waste in Ontario (EBR Registry Number 010-3864) – The Ministry of the Environment has proposed revisions to Guideline C-4 (1994). The proposed changes seek to provide clear direction about best management practices to generators, carriers and receivers of biomedical waste to help ensure that biomedical waste is properly managed in order to protect human health and the environment. Comments will be accepted until Dec. 22, 2008.
Review of Ontario’s Waste Diversion Act, 2002: Discussion Paper for Public Consultation (EBR Registry Number 010-4676) – Ontario is proposing to adopt a zero waste approach to help reduce waste, increase diversion, and build a greener economy and more sustainable society. The Ministry of the Environment is seeking input from the public and stakeholders to help determine policy direction relating to the review of the Waste Diversion Act and waste management strategies. Comments will be accepted until Jan. 15, 2009. Proposal for Amending Ontario Regulation 153/04, Brownfields Records of Site Condition (EBR Registry Number 010-4642) – Comments will be accepted until Feb. 3, 2009. On August 10, 2008, residents were forced to evacuate their homes due to a massive explosion at the Sunrise propane facility in north-west Toronto. One firefighter died while trying to put out the fire and several minor injuries were reported. Unfortunately CIELAP had warned about such an event in its 2000 publication The ‘New Public Management Comes to Ontario’ – A study of Ontario’s Technical Standards and Safety Authority (TSSA) and the impacts of putting public safety in private hands. Upon the release of its report CIELAP, along with other ENGOs had written to the Premier, the Minister of Small Business and Consumer Services, the Ontario Ombudsman and the Office of the Auditor General of Ontario. CIELAP wants the Ontario government to reclaim control of the TSSA. Visit Alternatives Journal’s website to access a podcast featuring CIELAP Research Director Maureen Carter-Whitney as she discusses potential solutions to help Calgary protect its near-urban lands. (12m43s-36m52s) . December 15, 7 p.m. - Being Caribou (2004), Directed by Leanne Allison & Diana Wilson. Environmentalist Leanne Allison and wildlife Biologist Karsten Heuer follow a herd of 120,000 caribou on foot, across 1,500 kilometers of rugged Arctic tundra to raise awareness of threats to the caribou’s survival. The film screening will be followed by a conversation with Dr Justina Ray, Executive Director, Wildlife Conservation Society Canada, and co-author of "Caribou and the North: A Shared Future". Copies of this publication will be available at the event. January 19, 7 p.m. - Four Wings and a Prayer (2007). Directed by Nick de Pencier, this documentary is about one of the world's most beautiful and mysterious creatures: the Monarch butterfly. Nowhere in nature is there a more powerful mix of scientific marvel, awesome beauty, and epic struggle for survival. All screenings are held at NFB Mediatheque, 150 John St, Toronto. On November 13 and 14 CIELAP held its 4th Partnering for Sustainability workshop. This was an interactive, discussion-based forum that attracted Canadian stakeholders to share case studies, lessons learned, and best practices and to propose alternatives for how resilient agricultural systems and sustainable agriculture could be advanced. The workshop’s three sub-themes – Valuing landscape services (ecosystem goods and services and multi-functional uses of agriculture); Local food systems and urban-rural linkages; and Agricultural production systems – provided focus for the discussions. Download the workshop case studies and presentations, or give your comments on the workshop themes and related questions using our online forum. On October 15, 2008, CIELAP and CELA co-sponsored Canada’s first Nanotechnology Forum, which was organized by the St. Lawrence Centre Forum. Speakers introduced the issue of nanotechnology from a broad perspective and discussed the implications for Canadians. CIELAP's Senior Policy Analyst Susan Holtz presented CIELAP's work on the issue and provided the policy recommendations from its discussion paper on a Framework for Canadian Nanotechnology Policy. The audience raised excellent questions, including how they could be informed about what products contain nanomaterials and how better public education could take place. For those who couldn’t attend, an audio stream of the event is available on the St. Lawrence Centre Forum’s website. For the past several years CIELAP has been working with a partner, Wildlife Society of South Africa, on establishing an environmental law centre to help South Africans know how their environmental laws can help them address issues of water and toxic pollution. The initial support came from IDRC and now our partner has managed to secure funding from the Table Mountain Foundation to hire a South African to take this project the next stage – from conception to implementation. Please donate to CIELAP today. You will receive a tax receipt for your donation.